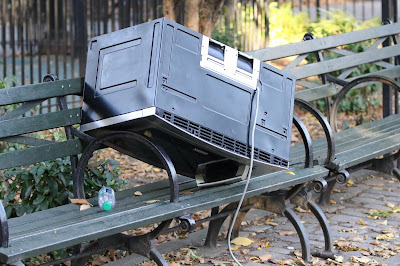 Microwave photo in Tompkins Square Park this morning by Steven. Also, as a courtesy and reminder: When it comes to microwaving soups or stews, there's great potential for food to splash everywhere. Ideally, the best way to avoid issues is to first cover up your bowl with either a plate or a napkin. But if it’s too late for that approach, and you see that your food has erupted or that you’ve left a mess in your wake, the responsible thing to do is to clean up after yourself. Now enjoy this new Park amenity! are you sure there isn't a dog in there? A dog? How about the body of a professional basketball player?!? Too bad it isn't USB ready. That way it can hook up to a linknyc tower so derelicts can dine on hot pockets and ramen cups while they watch youtube all day. Way to continue demeaning the word amenity, giving realtors one less gimmick to sell their over-priced abodes. Kudos.